I've been busy recently working on all sorts of house projects. One interesting trend I've noticed is that projects that somehow involve the cats seem to rise on the priority list and thus get done first. Weird, must just be odd coincidence. 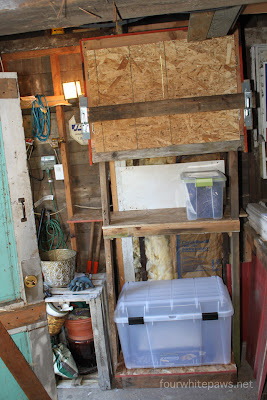 The new built in feeder in the garage needed shelves under it to store extra foods. As you can see, the space where the feeder went was wasted space before. Lots of crap piled high on an old wood stove that the former occupants used but I never touched. 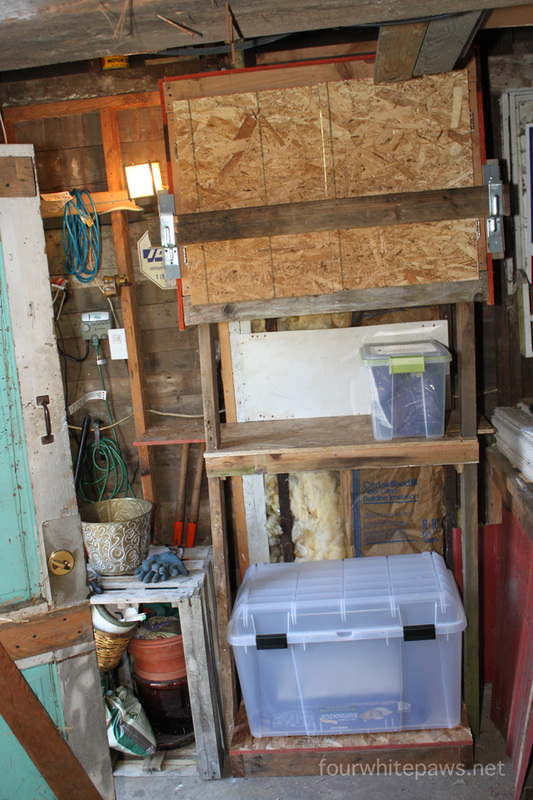 So, stove and crap go bye bye, feeder and shelves get constructed and ta-dah, space is useful! 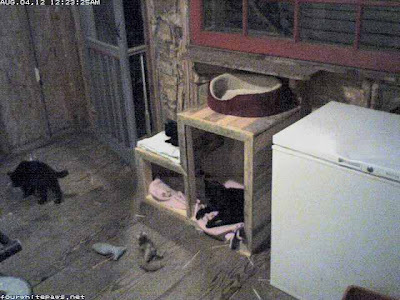 Oliver's guest house was occupying the back porch as a means to keep the red cat bed from sitting on the floor. When it got moved back outside, I needed something to hold his day bed off the floor. So, I scrounged up some old shipping pallets and used the materials to build a simple sturdy piece of feral furniture. The beauty of this project was that it cost me only a few hours time, all the materials were reused scrap, even the nails! 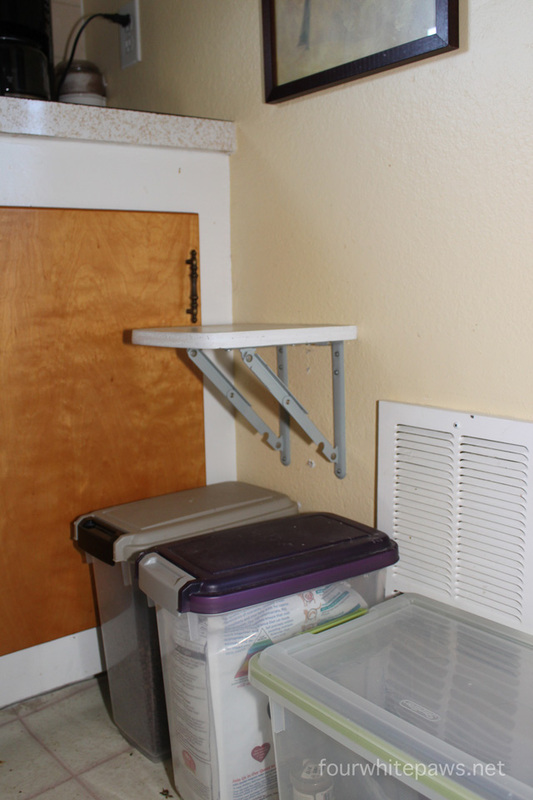 Most kitty guardians work hard to keep their cats from getting on the kitchen counters, so why would I build a special folding step to assist the cats to get onto the counter?! The shelf is for Buddy. After watching him try to jump onto the counter numerous times and fail to make it, I thought I had better figure something out before he hurt himself. So, I built him this folding shelf. It folds down so the cabinet can be accessed. 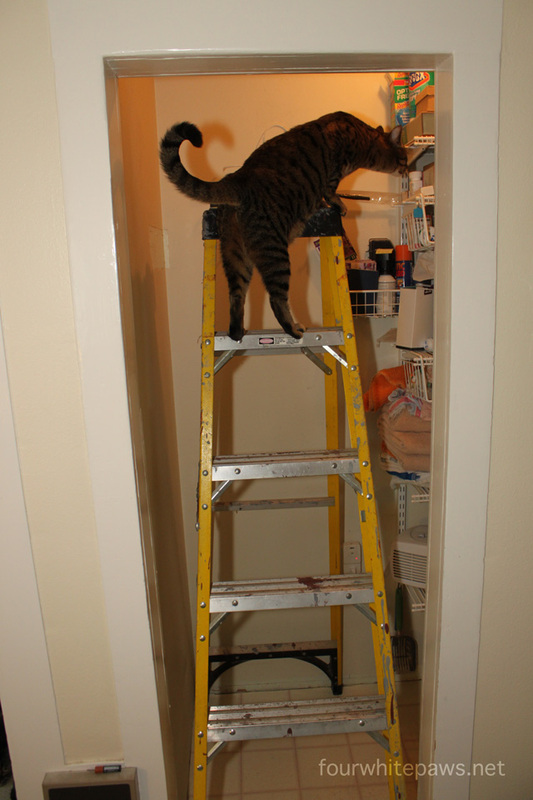 Now, Buddy can go up and down from the counter without fear of injury. Oliver's family sleeps during the day somewhere on the property of the house across the street from me. They only come here during the night, where they spend the entire night hanging out with Oliver. The house across the street is a rental has recently has been undergoing a significant remodel in anticipation of a new family moving in. I fear that if a family moves in with younger children then Oliver's family may not feel safe sleeping there anymore. So, I want to be prepared for that possibility by having a suitable comfortable housing option for them here. 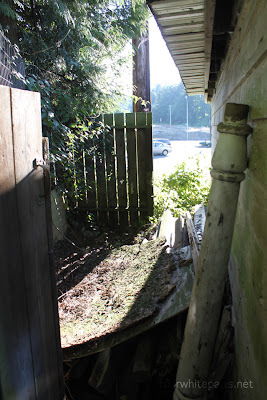 Behind the garage is currently wasted space, with a pile of old lumber. 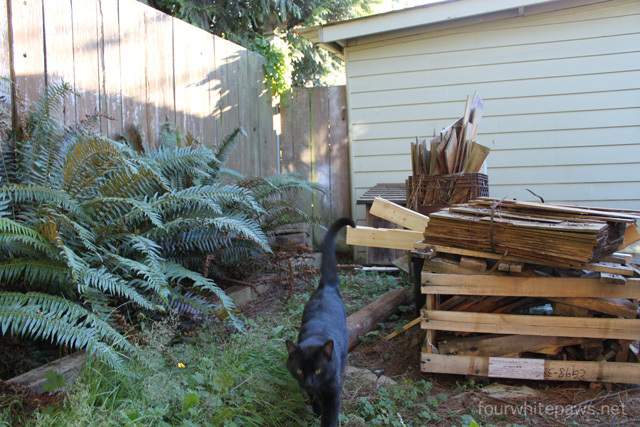 My plan is to clean out that space and convert the pile of lumber into feral housing. The location is hidden and relatively undisturbed, so hopefully it would be quiet and safe. I'm also planning to build some holding pens in the garage for TNR cats who are either waiting for transport to the spay/neuter clinic or are recovering after visiting the clinic. So much to do, so little time! Phil...Terrific, just terrific. I need someone handy in my life. Wow! You are starting up a feral resort! It so nice to see them so well cared for! I'm glad to hear they have special accommodations to be able to counter surf! I wasn't able to do anything that was on sitting on the floor due to space constraints, so having something mounted on the wall that could fold away seemed like the next best option. Love it. Yeah - same here...cat projects get moved up on the list. :) The next one is some sort of feeding/housing set up for Allie (the momma cat of the alcohol kittens). I haven't seen her but I suspect she is still around. Just gotta be careful or the condo dorks will leave me nasty notes. 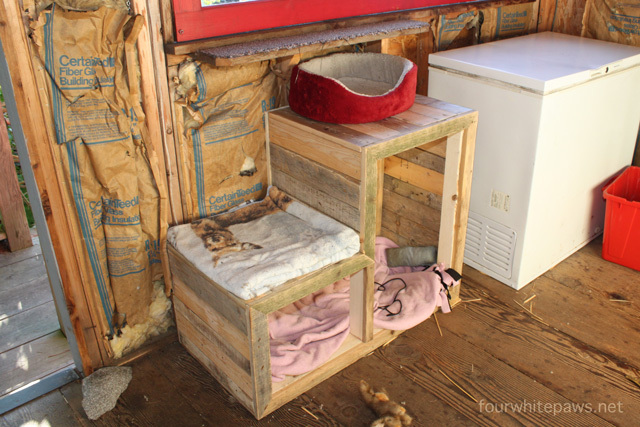 :) We use the rubbermaid versions here as well, but I LOVE the constructed ones you make. I am certain I could come up with more feline related and approved projects if you were to come here. Really. 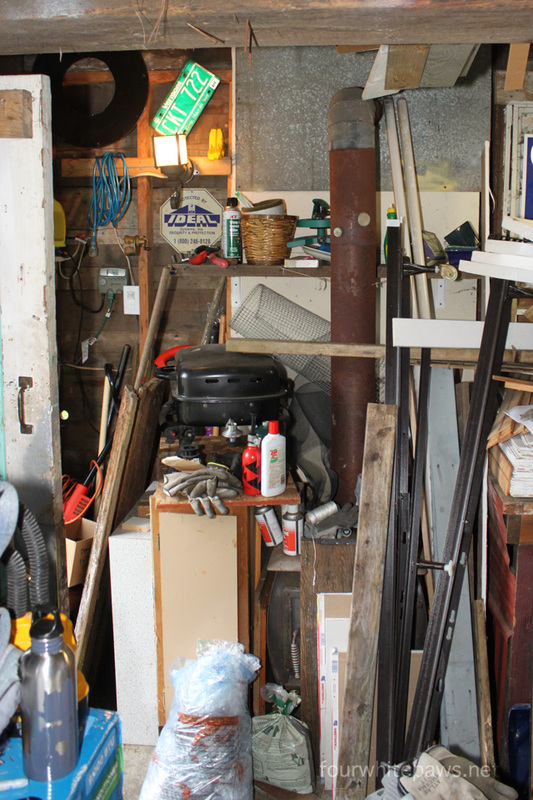 I have a garage you can organize! Wow, Phil. You really have improved the ferals' lives. Great projects, great ideas. We have a few step-up arrangements for Lucy around the house. Our windows are low to the ground, so she can get up to look out, but we put a small box at the foot of the bed (which is pretty high) so that she can get on the bed for naps. I'm STILL not sure how she got on top of the piano! I'm thinking shipping to Canada, Customs, etc. is not exactly cost-effective. LOL. I'll make a note to snap couple of pics and send measurements, though. you have one hell of a "honey do" list that is for sure! You are so handy!!!! Can we hire you out? Love how you are building crates for TNR as well...KUDOS! Phil, you are the man. THE Cat Man. You take care of all of your cats, both inside and out, in so many special ways. Were you a cat in a past life? I am in awe of what you do for them. I am the same way with cat projects. Funny how they always rise to the top of other projects. Kitties rule! !